People are drawn to Florida for a variety of reasons, and one reason related to the purchase of real estate is the state’s homestead law. Florida law allows generous tax exemptions (up to $50,000) to homeowners, and protection from creditor claims and forced sales in bankruptcy, often referred to as unlimited homestead protection. People also assume that if they own a piece of real estate, they are free to transfer, sell, or devise it in an estate plan as they see fit. However, Florida’s provisions controlling when and how homestead properties may be transferred or devised are some of the most complex aspects of the law. Given that homesteads, a person’s principal residence, are a central asset for most individuals upon death, understanding the restrictions imposed by the law on transferring the property, and the consequences of doing so improperly, are important for estate planning purposes. A discussion on the restrictions found in Florida’s homestead law on the permissible options for devising this property after death will follow below. a married owner is prohibited from mortgaging, selling, or gifting the property to anyone other than the spouse, or to him/herself and the spouse, unless the spouse also signs the deed – this rule applies even when the spouse has no ownership interest in the property. It is possible to get around these restrictions by having the spouse waive or disclaim homestead rights. Further, property owned as tenancy by the entirety (concurrent ownership only available to married couples) or as a joint tenancy with rights of survivorship are also avenues of avoiding the homestead restrictions. Of course, if the owner is unmarried and without minor children, he/she is free to transfer the property upon death as desired. If a homestead is transferred in violation of these restrictions, the surviving spouse receives the right to live on the property for the rest of his/her life, with the remaining property interest passing to all other descendants, including those not part of the deceased owner’s estate plan. This outcome can be a burden to the surviving spouse, since he/she has a duty to maintain the property for the benefit of the other descendants and must absorb these costs of upkeep alone. However, the surviving spouse can elect to take a one-half interest in the property, which distributes costs, but does expose him/her to being forced out if the other owners sell. 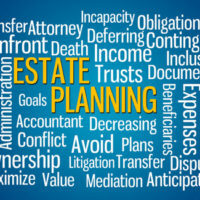 An experienced estate planning attorney is best situated to advise on the ownership interest that will best promote one’s expectations and desires. Your home is one of your most precious assets, and you want to ensure to goes to the individual you want after death. Attorney William Rambaum is well-versed in the complications of estate planning in Florida, and can use years of experience helping Florida’s seniors to create a plan that will work for generations to come. Contact the Oldsmar law firm to schedule an appointment.